British Columbian folkies Shred Kelly had a busy summer touring in support of last year's In the Hills, and they're keeping the campaign going with a new video for the album cut "New Black." The clip for this brightly upbeat folk ditty shows the band members comically training for a multi-event sports day against a gang of baddies called the Cheetahs. The opposing groups compete in an egg-and-spoon race, a sack race, a tug-of-war, and various obstacle courses, and the whole thing naturally culminates in a band performance. The clip was directed by Chrisina Ienna. 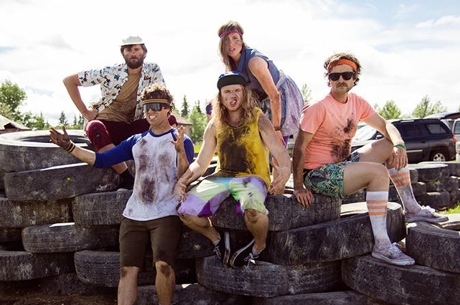 The group explained in a statement, "We made this video during the Alberta floods, and our band had been separated in various parts of BC and Alberta. The five of us couldn't connect because of road closures, a car crash (with Jordan and Steve) and no one picking up our hitch-hiking drummer for four days and we had to cancel three performances. We met up on day five and put this video together, so it was not only super fun to make, but it was also the silver lining after four really hectic days prior." Scroll past the band's upcoming tour schedule to watch.